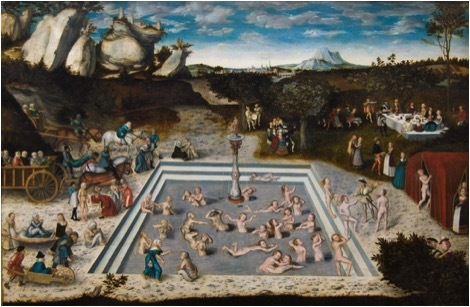 “The Fountain of Youth” by Lucas Cranach the elder (1546). A wizened old surfer observing idle young groms once said, “Youth is wasted on the young” – or perhaps it was Irish playwright George Bernard Shaw. No matter. The fact is, that as we get older, we yearn for the flexibility, strength and quickness of our youth. True that 60 is the new 50, and 70 the new 60, but eventually time starts catching up with us. As surfers, how do we adapt to the undeniable fact that we are gradually losing muscle mass, flexibility and coordination? Certainly, time spent in the lineup, gym and swimming pool can help us claw back some of the lost powers of our younger selves, but alas, there is no fountain of youth. In this 30th issue of Surfing Medicine, SMA Kahuna emeritus, Bill Jones explores his life through the lens of surfing and describes how despite medical setbacks, he has learned to make adjustments in technique, equipment, and expectations and is just as stoked to get out in the water now as he was as a teenager. Perhaps a more appropriate quote from Mr. GB Shaw is in order: “We don’t stop playing because we grow old; we grow old because we stop playing”. If you too want to be a player forever and learn more about the burgeoning field of Surfiatrics, read Bill’s article and sign up for the “Old Guys Rule” conference he has organized in Punta Mita, Mexico, April 23-29, 2018. Also in this issue find an interview with another globe-trotting wizened surf doc, Terry Farrell, who gets to run with the big dogs as the as the WSL’s Big Wave Tour medical director. Terry tells us how he goes about preparing for the inevitable carnage associated with paddling into monster waves including what he terms “shaken surfer syndrome”. Want to know more about the seafood poisoning Ciguatera but afraid to do a Google search ‘cause you don’t even know how to spell it? Well you’ve made the drop and landed in the right place. Plus, learn heaps more about Barefoot Doctors, surfing eye injuries and the medical risks associated with surfing after a rain storm.